As of June 11th, federal network neutrality protections formally expired, thanks to Chairman Ajit Pai and the other Republican Commissioners at the FCC. In the months leading up to the vote, Pai has continued to press the talking point that the market will protect consumers. 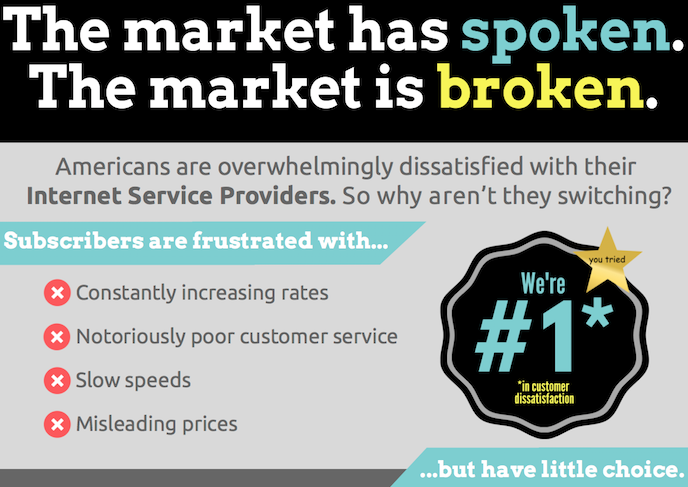 Now is a good time to pull out our infographic from last year, "The Market Has Spoken. The Market Is Broken," to remind Chairman Pai that a broken market isn’t much protection. Is a Broken Market Able to Protect Anyone? If people Americans aren’t satisfied with their current ISP, they should just switch, right? That’s why we have a competitive market — so subscribers who are unhappy with one Internet service can switch to another, right? Sounds great, but when there is no competition where you live, “you’ll take what you git and you won’t throw a fit.” At least, that’s what monopoly providers expect. Our infographic addresses national ISPs that deliver services in both urban and rural areas. Time and again, consumers report that they’re dissatisfied with companies such as Comcast, AT&T, and CenturyLink, but with no options in many areas, there is no recourse. Now that we know approximately 177 million Americans live under the shadow of ISPs that willingly offend network neutrality policies, the faulty market is a more important issue than ever. National ISPs know the monumental task ahead of new entrants, but also know that if subscribers get a taste for something better, big companies will lose their advantage and subscribership. In order to keep their position at the top of the heap, they invest millions of dollars each year into lobbying at the state and federal level. By advancing legislation that effectively blocks smaller players and municipalities from developing new and better services, Comcast, AT&T, and others can maintain their monopolies. Our infographic looks at some hard numbers and offers examples of solutions. When communities find a way to get past the big telecom and cable industry stranglehold, they can thrive with local control and accountability. Check out a larger image here.